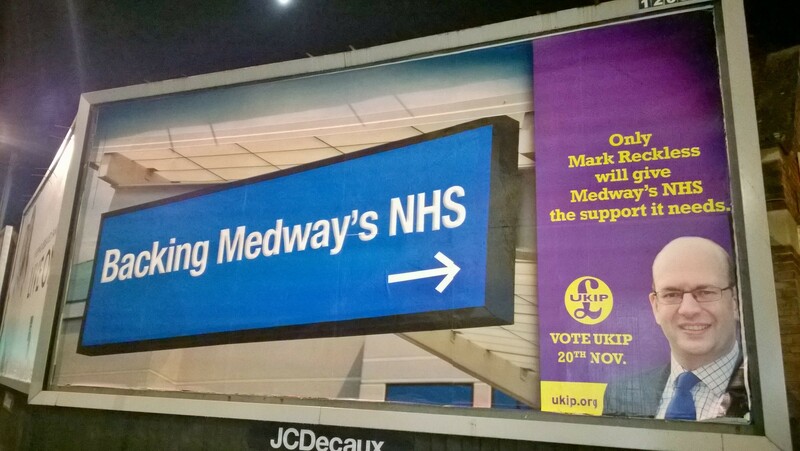 After apparent briefing about the routine use of a photograph of Mark Reckless meeting with the Acting Chief Executive of Medway Hospital, Mark Reckless has questioned Medway hospital’s board about its priorities. He said: “Problems at Medway hospital, most worryingly around one in ten more patients dying there than should be the case, have been left to fester for over a decade under both Labour and Conservative-led governments. “As a Foundation Trust the Board at Medway hospital is responsible for its performance, but has failed properly to improve it, the trust remaining in special measures. Indeed, despite seriously inadequate standards of clinical care which led to it being place in special measures, Medway hospital’s Board was distracted for up to two years by failed plans to merge with Darenth Valley hospital. Incredibly, Medway hospital, as a foundation trust, was meant to be helping Darenth Valley escape from its more direct management by the Department of Health. “Further, once Medway hospital was placed in special measures, its Board failed either to remove its Chief Executive, or to ensure he had sufficient support to turn round the hospital. When that Chief Executive and the Board Chair later resigned, the Board was overseen by a temporary Chair earning up to £200,000 a year for barely a one day week, with finances put in the hands of a Treasurer earning £40,000 a month. “Notwithstanding such issues at Board level, throughout this period, and quite properly as the MP, I sought to support the clinical staff at the hospital and their leadership, notably Dr Philip Barnes as Medical Director and latterly Acting Chief Executive. “As most past and present MPs would during a campaign seeking re-election, I have referred in literature to work I did as the MP, and illustrated it with relevant photographs taken with the agreement of those pictured. “MPs across the country will have used pictures of themselves with the Chair or Chief Executive of their local hospital or similar in such content. I am not aware of Medway hospital complaining of any Labour MP doing that in the past. “I have today had an exchange of letters with the Chair of Medway hospital. They do not show my doing anything unusual for someone seeking re-election as an MP. They do, however, show extraordinary involvement by an ostensibly neutral chair of an NHS body in an election. “My reply should have put an end to the matter. Instead, publicly paid press officers appear to have continued briefing this matter, rather than dealing with more pressing matters for a hospital in special measures. “I am demanding an urgent meeting tomorrow with Mrs Winning to discuss her intervention in this matter. This entry was posted in Health and tagged conservatives, Health, mark reckless, Medway, medway council, NHS, politics, rochester and strood, UKIP. Bookmark the permalink. The hospital board appears quite childish.